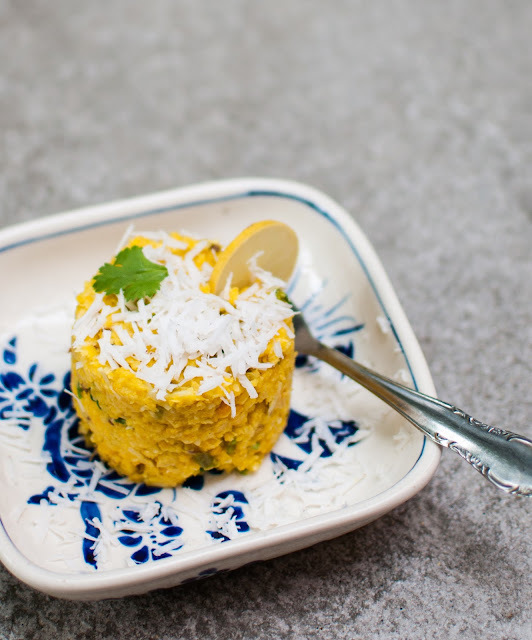 Fresh corn on the cob is a seasonal pleasure that we associate with the monsoons in India, this makai ka kees is made with the tender fresh corn which is in season right now. If you haven’t had the boiled corn on the cob and grilled corn on the cob in north India you are missing something and you must make amends whenever you get an opportunity. The best street foods are the ones that come fresh off a cart and use fresh produce of the season, fresh corn gives ample variety to street foods in north India during monsoons. The local varieties of corn are flavourful and can be used in many ways, the tender and the mature corn are used differently for different recipes to make the best of the fresh produce of the season. We make boiled corn on the cob, corn fritters, corn idli, corn dhokla and even corn pancakes and breakfast cereal made with fresh corn. The fresh corn polenta is a quick recipe that I like a lot. One of the savoury breakfast cereals made with fresh corn is makai ka kees which is like the South Indian upma in consistency, the taste is incredibly refreshing and quite different from any other Indian breakfasts. Makai ka kees is from Madhya Pradesh where it is also called as makai ke kan (fresh corn grits) or makai ka upma by some people. Makai ka kees literally translates to grated fresh corn, which is cooked with a light spicing and some milk to get a creamy yet light texture. 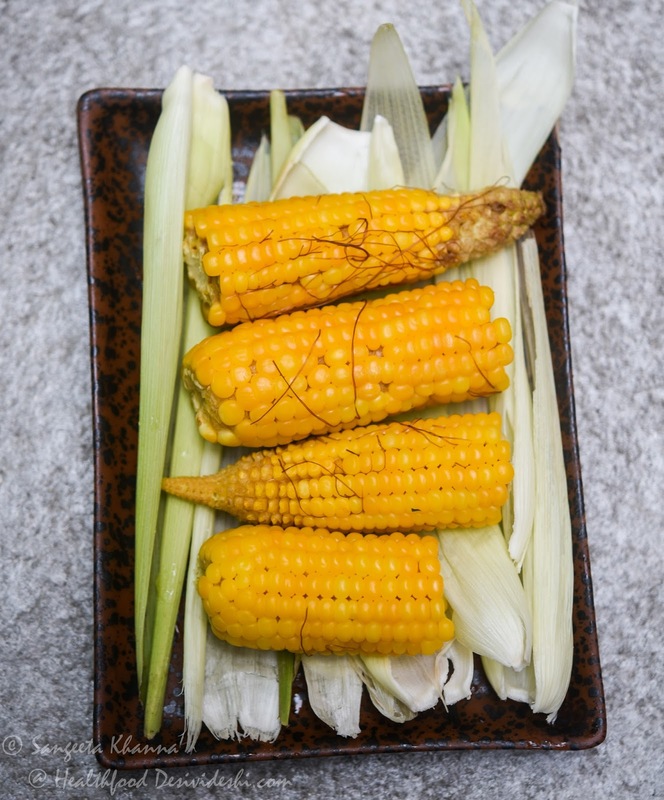 Every family has a slightly different recipe of makai ka kees, this recipe comes from a friend who used to cook at her home whenever she could find fresh corn. Her recipe has been adapted to suit our taste since the last decade I have been making this. You can also make minor changes to suit your taste, I am sure you will be hooked to the recipe if you like fresh corn. Remove the corns from the cob using your fingers of scrape them off using a paring knife. You can use a box grater to scrape the corn from the cob, that is how it is supposed to be done in the traditional recipe. I like to keep the corn kernels separated in my fridge so the breakfast is quick to assemble. The separated corn kernels keep well for 3-4 days if refrigerated in an airtight container. I keep some fresh coconut wedges in the fridge too mostly, it is easy to take out one wedge and grate over some food whenever needed or make a quick coconut chutney whenever required. You can use coconut flakes or shavings if you wish, after soaking them in warm water for a couple of minutes. Pulse the corn kernels in mixie or food processor to make a really coarse paste. You don’t need to use the food processor if you scrape the corn using a box grater. Heat the ghee, tip in the asafoetida, cumin, green chilies and ginger in that order, wait till everything sizzles and gets aromatic. Add the turmeric powder and mix well, then add the corn paste immediately along with salt and pepper and start mixing it quickly. Once the corn paste gets sticky after partial cooking, you can start adding the milk slowly, 1 tbsp at a time so it soaks up while it cooks for a couple of minutes. Add half of the coriander leaves and grated coconut to the cooking makai ka kees, pour the remaining milk, mix well, cover and cook for 3-4 minutes. The cooking time and the quantity of milk added will depend on how tender or mature the corn is. So watch out this step and adjust seasoning and consistency accordingly. Once cooked to a thick halwa consistency, the makai ka kees is ready. Serve hot, garnished with the remaining coriander leaves and coconut shavings. Serve with a slice of lime so one can squeeze if required. I don’t need lime juice mostly but the husband loves a generous dash of lime juice on makai ka kees. 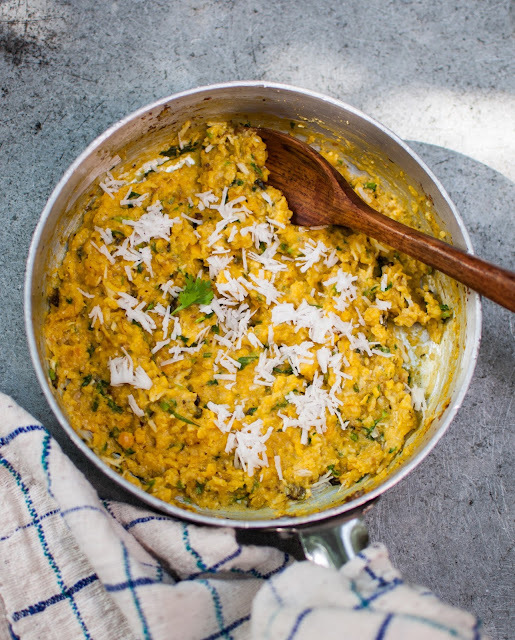 Makai ka kees is actually an Indian version of the fresh corn polenta or fresh corn porridge made in some other countries. Every agrarian society that grows corn has made use of pulverised fresh corn in some way or the other. Makai ka kees or makai ke kan is one of the recipes cooked in central India. Do let me know whenever you try this recipe.